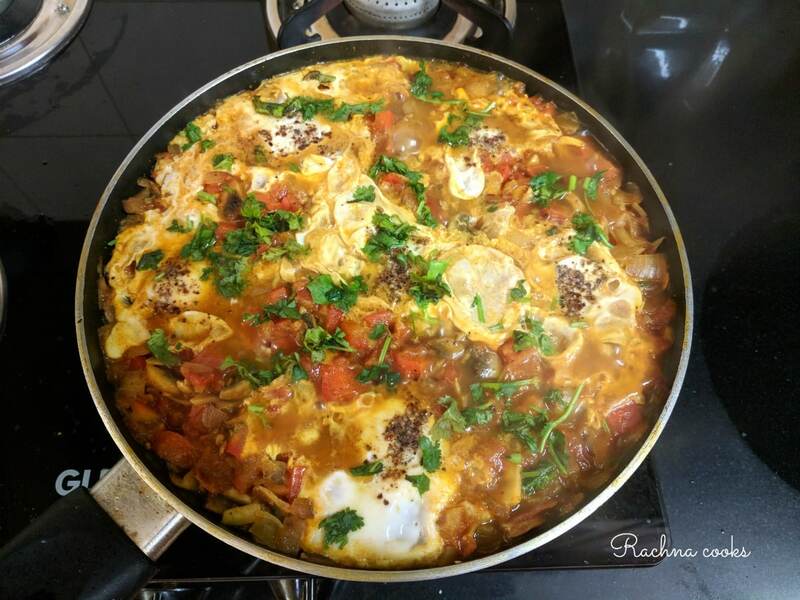 This one-pot meal made with poached eggs, peppers, veggies and spices is delicious and a complete meal for the family. It is also ready in under half an hour. Heat olive oil in a large deep pan/skillet. Add in the onion, garlic, pepper and mushroom. Let it cook down for about 5-6 minutes. Now add in the black pepper (keep some for eggs), cumin, turmeric powder, paprika, salt and tomatoes. Cover and cook for about 7-8 minutes till you get a thick sauce. Now make wells in the sauce using a spoon and break eggs into it. I break the egg in a bowl and not directly over the pan. That way the yolks stay intact. Garnish the eggs with some salt and pepper. Cover and let the eggs poach in the tomato sauce on low heat for another 5-6 minutes. Turn off the gas when the whites start to set and the yolks are still runny. You can make the whites set faster by spooning some hot tomato sauce on top. Garnish with chopped coriander leaves. Don’t used tomato puree just roughly chopped or crushed tomatoes. You want the sauce to be thick and not very runny. 1. I love mushroom hence I added it. It is completely optional and you can skip it. 2. Charred onions and peppers will add a depth of flavour to the recipe. 3. Don’t wait for the eggs to become completely cooked before taking them off the heat. They will get overcooked by the time you eat as they continue to cook even after you take them off the fire. 4. You could use olives or feta cheese as serving suggestions if you have them available.